All you need to run a successful Signing Smart workshop for childcare providers and teachers of hearing infants and toddlers right out of the box! Developed from the childcare worker's perspective, it is highly effective in reaching and galvanizing this population through its emphasis on Signing Smart strategies developed specifically for group settings. More than an adaptation of a program designed for parents, this completely unique workshop will allow you to speak your audience's language. It gives you the tools to teach childcare workers and teachers of hearing infants and toddlers simple and effective techniques to easily integrate Signing Smart into a group environment with multiple caretakers. Includes comprehensive and detailed presentation notes, adult group activities, and PowerPoint slides/overheads. Instructors also receive a CD of teacher handouts and other reproducibles; DVD Clip Bank of class clips that specifically complement the workshop presentation. These clips contain Signing Smart strategies in action as well as children's versions of many common signs. In addition, all Signing Smart Instructors benefit from a wealth of other business and program support. NOTE: Curriculum not available for purchase in all areas. 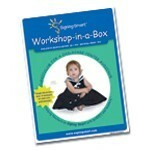 Please Contact Us for information on becoming a Signing Smart Instructor and to purchase the Workshop-in-a-Box & Power Point slides for a Childcare Center Audience.